Learn to make a set of textured bangle bracelets, one in sterling silver, one in bronze, and three in copper. You will develop fabrication skills, including: measurement, texturing, filing, forming, soldering, and tumbler finishing. 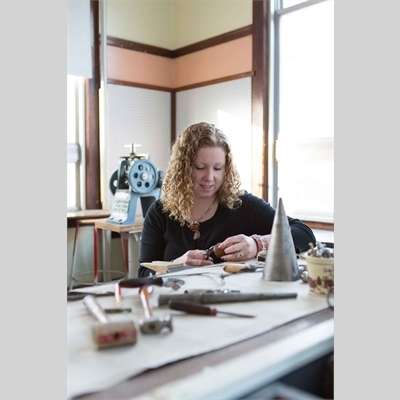 All materials will be provided, including: sterling silver, bronze, and copper, saw blades, solder, and sandpaper. A $35 materials fee will be due to the teacher on the first night of class. Meet near Wood Shop; park off the Mill Street entrance and enter door #30 to the left of gates. See map on page 53.